Better pictures not available because I ate it all already. 1 cup of pitted, chopped plums* (the number of plums you'll need will vary depending on the size of the plums, but you want about 1 cup of the final product. Slightly more or less than a cup will be fine, it will just adjust your crust/filling ratio in the finished product. Mix all ingredients together. Ideally, let them sit for a few minutes to marinate in their own juices (you can just let them sit while you make the batter, as follows). I expect you could make this with other stone fruits (peaches, nectarines, apricots, cherries) and/or mix in other fruits with your stone fruits if you like. Cobblers are forgiving, and the batter and assembly will work for ~1 cup of whatever typical pie filling you like. In a small (~5x7) baking dish (or a few small ramekins, if you prefer individual servings), melt the butter completely. If it's not already, spread it around the bottom of the dish. In a separate bowl (as one who constantly ignores instructions for separate bowls, trust me this time: you need a separate bowl), whisk together the flour, sugar and baking powder. Stir in the milk until just combined. The dough should be slightly runny. Pour the filling over the batter (tip: when you pour, don't pour it all straight in the center, but rather around the pan to make sure it spreads out as much as possible). Do not stir. Bake at 375 F for 15-20 minutes (potentially less if you're using individual ramekins), or until top of the crust is golden brown. Serve with vanilla ice cream. Duh. This sounds delicious and I don't see plums very often in baked desserts. I'll definitely have to give this a try! Mm its been ages since I've had a cobbler. A plum one sounds delicious! Tiny plums - I haven't seen them. I guess pitting them would be a bit of extra work. Cheers from Carole's Chatter! this looks so juicy and yummy. Are tiny plums an actual plum variety? I'm guessing they aren't normal plums that don't grow very big lol. I haven't heard of them in Australia. I'm honestly not sure--they came in our CSA pickup, so there wasn't much info about them. They were slightly sweeter and mushier (not in a bad way) than normal plums, but otherwise basically the same. Surprisingly, they were fairly easy to pit--maybe because they were a bit overripe? I'd never thought to us plums in one but it was goooood. Ooh that sounds delicious as well. I've never baked with plums before. Why did it take me so long? If you do, I'd love to hear what you think! Well of course. Cobbler without ice cream is just plain silly. 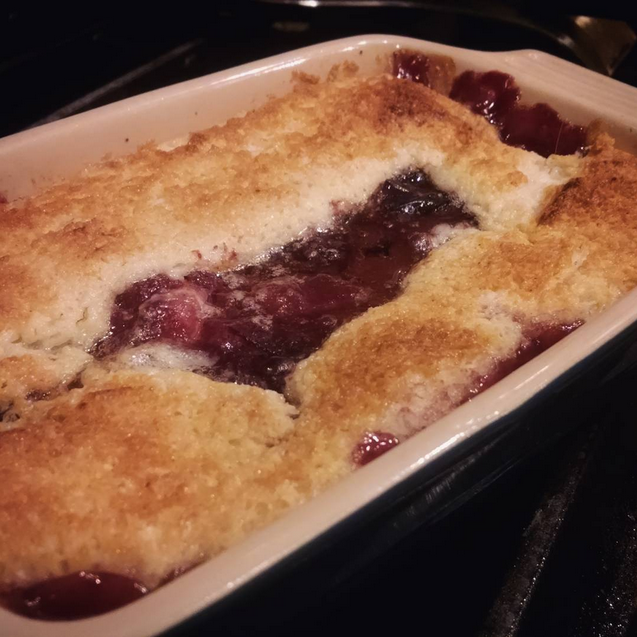 I love plums and this cobbler sounds delicious.